This past weekend the pumpkin cravings hit me hard. It feels like everything good about fall here in DC: crisp cold morning, sunny warm afternoons, skirt and scarf and no jacket necessary kind of weather. 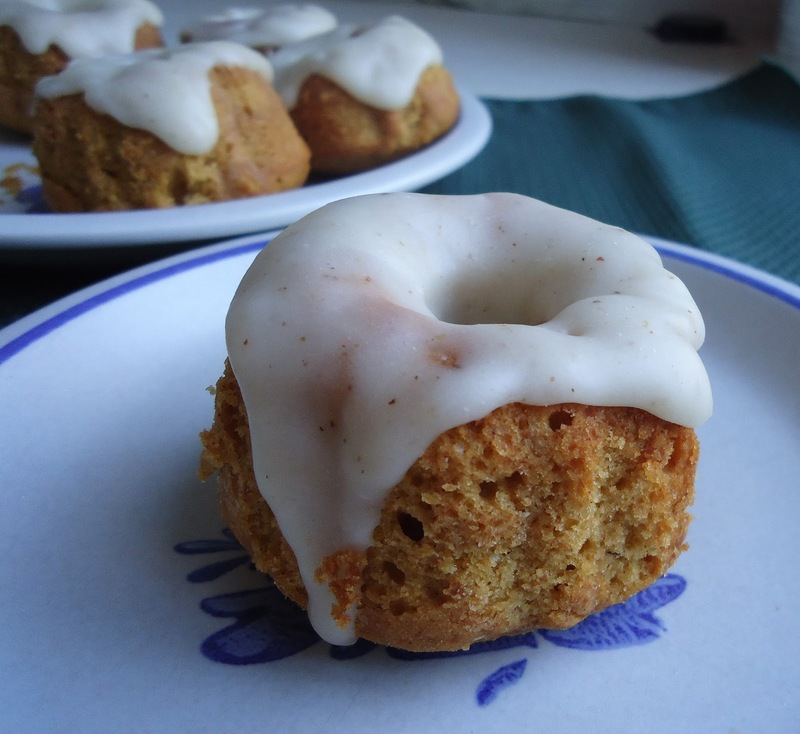 Basically the perfect time of year for a hot cup of coffee accompanied by a spicy pumpkin-y baked good. Yessssss. 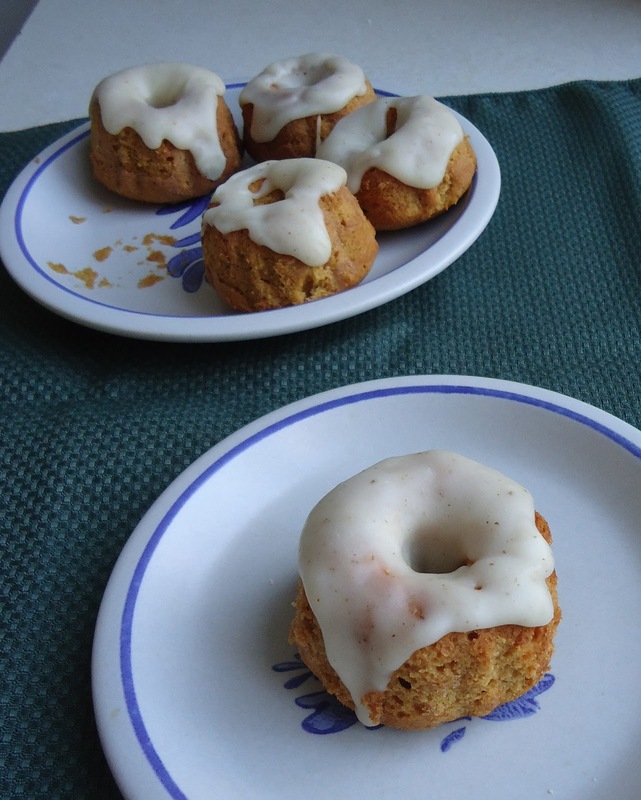 Saturday afternoon/evening I turned up some music, put on my apron, and made something delicious that I've been eyeing all week -- Pumpkin-Ginger Bundt Cakes with Browned Butter Glaze. There are some people who do crazy things like not eat sweets before a race. Clearly I am not one of those people. 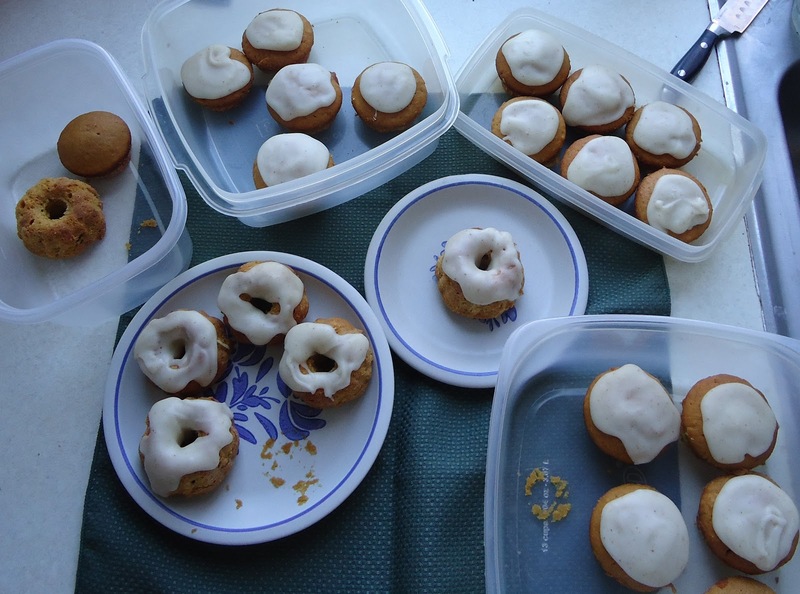 I’m not saying I won Sunday’s race because of these bundt cakes…but correlation vs. causation = potato vs. potato, right? (No that is not right. But in this context I’m going with it.) Basically, these were great the night before the race, and even greater the night after. There’s something almost cake donut-y to the texture, and the slight crunch of sugar in the Browned Butter Glaze might be my new favorite thing. At first I wasn't sure if I just thought they were awesome, or if they actually are that good, but LLC confirmed that "no, they are that amazing" as she enjoyed one with her breakfast coffee yesterday. I think the awesome light-but-dense texture of the cake (I know that’s a oxymoron, but if you try them you’ll know what I mean) can be attributed to all of the beating time – seriously, that butter and those eggs didn’t know what hit them! – and subsequent careful folding to keep it all from going flat and over-mixed. 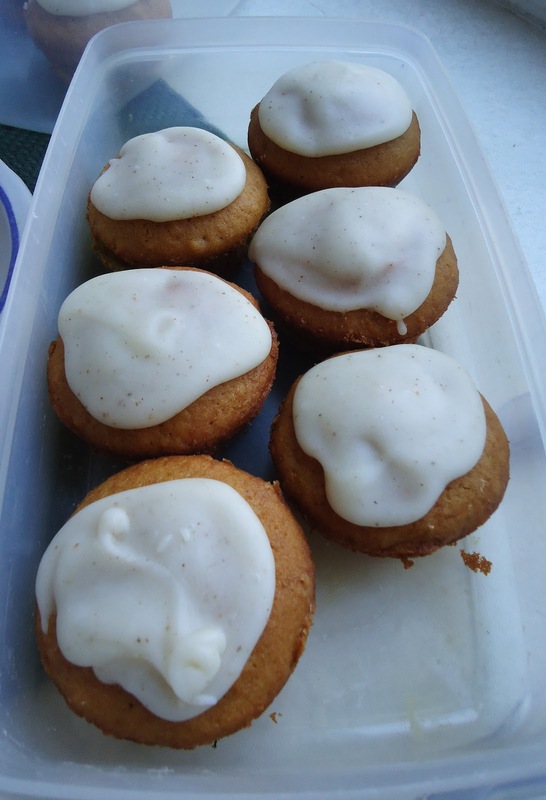 My love of all things pumpkin has been well-documented on Eat Run Read, but I think this is my favorite pumpkin cake/cupcake recipe to date! As the original recipe warns, be sure to thoroughly grease and flour your pans! You don’t want to lose any of these babies to sticking. I have a silicone mini bundt pan (sidenote: it feels weird calling it a “pan” when it’s essentially rubber), which makes it easier to push the cakes out (since you can actually turn the pans inside-out). Yield: 6 mini bundt cakes plus about 12 medium-sized cupcakes (or one large bundt cake) -- I tend to make very small cupcakes, so I ended up with 6 mini bundts and 18 cupcakes. Preheat the oven to 350 degrees F. Grease and flour a 6-well mini bundt pan, and line a 12-muffin/cupcake pan. In a large mixing bowl, sift together the cake flour, baking powder, salt, ginger, cinnamon, and nutmeg; Set aside. In a large bowl with a beater(or a stand mixer fitter with the paddle attachment), beat the butter on medium speed until creamy (about 3 minutes). In 1/2 cup increments add the brown sugar, beating well after each addition and scrapping down the bowl as necessary. Once all the sugar has been added, beat everything together on medium speed for 3-4 minutes. Scrape down the sides of the bowl. Add the egg yolks and beat on low until incorporated. Add the pumpkin pureé and oil, and vanilla, and beat until smooth. In a separate medium-sized bowl, beat the egg whites on medium-high speed until soft peaks form (if you’re using the same eggbeater, wash it before doing the egg whites, otherwise they won’t work). Now switch to a large rubber spatula. Fold in about 1/3 of the flour mixture. (How to fold: Cut down through the center and bring the heavier mixture back up to the top. Think down-across-up-and-over. Turn the bowl as you are doing this. Do not stir!) Keep folding until the flour has disappeared. Repeat with the remaining flour. Spoon the batter into the prepared bundt pan and muffin/cupcake tins. Bake for 25 minutes, or until the tops spring back when lightly pressed and a thin knife inserted into the center comes out clean. Remove the cake pan from the oven and place onto a cooling rack. Let the cakes sit in the pan for 10-15 minutes, before inverting onto a cookie rack to finish cooling. Pour the butter into a bowl and add the powdered sugar, salt, and milk. Quickly whisk until blended and smooth (it hardens fast). Immediately drizzle the glaze over the cakes and muffins. My kitchen counter as I take pictures/prep cupcakes to bring to work. I originally planned to half the recipe, but then in my singing-along-with-ZBB daze I totally spaced and added all the baking powder. Oh well! No harm in having extra cupcakes to take to work and share with the people I like!